Use cases for ElasticSearch, some fundamental concepts to understand, and some thoughts on when it's a good or a bad idea to use it. I'd like to write about some of the use cases for ElasticSearch, its main concepts, and some considerations on where it's a good/bad idea to consider using it. Also I'll try to describe some details about how ElasticSearch stores and retrieves documents and how we can extract the best of it. I hope that after that you would be familiarized with some technical stuff of ES and would be able to start applying some of this things in your projects. If you have ever used MongoDB probably you'll be familiarized with a JSON storage service. But what makes ES really special is its information retrieval nature. This combination of storage and querying/aggregation services makes ES really special and distant from the "document storage only" tools. Node: A single server that holds some data and participate on the cluster's indexing and querying. The http://localhost:9200/ is the address of our ES node. Here we are creating a blog post in the index blog with a type post and an id = 1. Note that it's possible to use a POST instead of aPUT to automatically generate the document id. 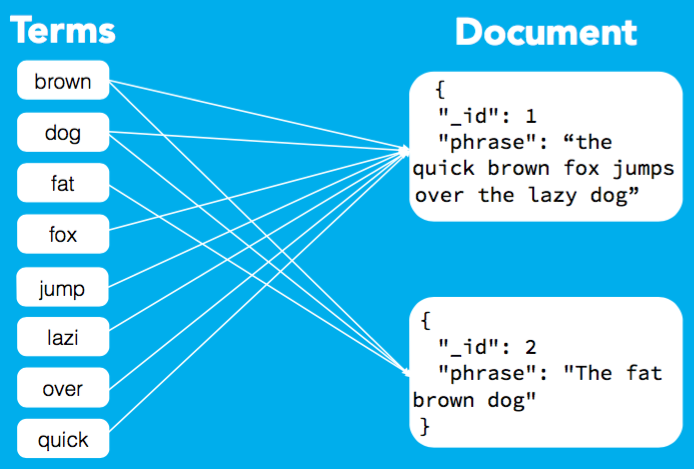 The document itself is a ordinary JSON document. 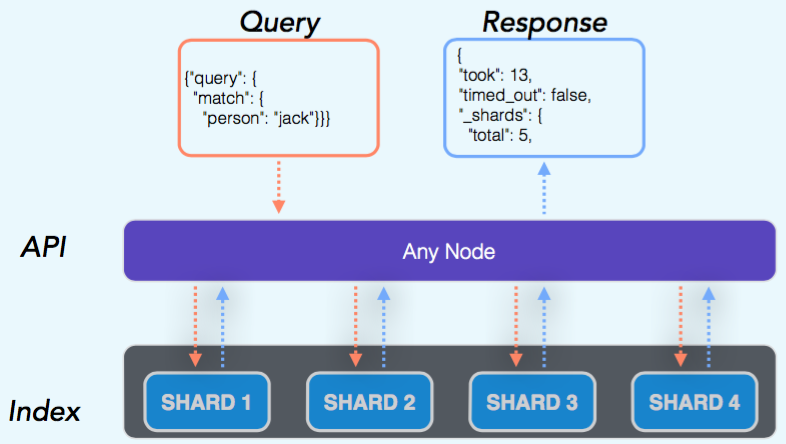 When you send a query to your ES cluster, the query will hit one of the nodes (in a round robin basis) and then it figures out which shards should be queried. Then the "query coordinator" node sends the query to each one of those shards to execute the query in parallel. After each node answers the query with the partial result, the node merges the result and sends it back to the user. One of the things that makes ES very fast in querying documents is that by default it already executes queries in parallel (traversing the shards). Every document that is sent to ES to be stored go through a hashing algorithm and then is sent to a shard. ES tries to distribute the document evenly across the shards of the index. Another important thing when storing documents is deciding the best way to store them enhancing the query speed. When designing solutions using ElasticSearch the most important thing to think about when storing documents is: how would I like to query for this document? This "query first" approach facilitates the use of all ES indexing possibilities to make our queries incredible fast. That's when the Analyzers of ES are very important. Analysis is a text transformation that takes as input a chunk of text and outputs terms (tokens). One of the best features of ES is that it comes with a lot of built-in analyzers. For example imagine a function that takes each word in a text block and returns the stemmed form of each word. Or a function that takes a text and remove all the stop words of it. Depending on what you need you can use one or more analyzers to transform the original text. In ES the analyzers are useful in helping us building good indexes (database indexes) and speeding up the search through our documents. Take a look in the ES Analysers documentation to see some examples of the analysers that come with ES. It's very difficult to write about ElasticSearch. At the same time it is simple to use and understand, and there are a lot of features to talk about. Sometimes you have more than one way to index some documents or query them. I believe that only with experience using ES can you become better and take most of it. This doesn't mean that you shouldn't try using it. One of the benefits of ES is that it is very easy to install and, for many use cases, it won't be your primary datasource, so you can be less worried about trying it. As I said earlier, it's important to know the things that ES is good for and the things that it's bad for. A vast majority of people that I hear complaining about ES are using it in a way it isn't meant to be. ElasticSearch isn't quite new but is evolving fast. They are evolving and adding new good stuff on every release. But its core is very consistent and the fact that it's built on top of Lucene should give you more confidence to use it. That's it! I'm very grateful for writing this post because it helped me refresh some concepts of ES and also taking a look onto the new features. I hope that in the near future I'll have the opportunity to use these features in something useful. See ya!